Want To Sell Little Pals? The ideal garden set and perfect gift for any time of the year for budding young gardeners! Includes tool/storage bag with handy pockets, watering can, hand trowel and hand fork, and kids gloves. Watering can is bright green. Tools have metal heads and sturdy wooden handles. All-purpose two-tone blue cotton gloves with knuckle guard and reinforced cuff to protect little hands. Recommended Ages 3 to 10. The perfect set to get them started in the garden! 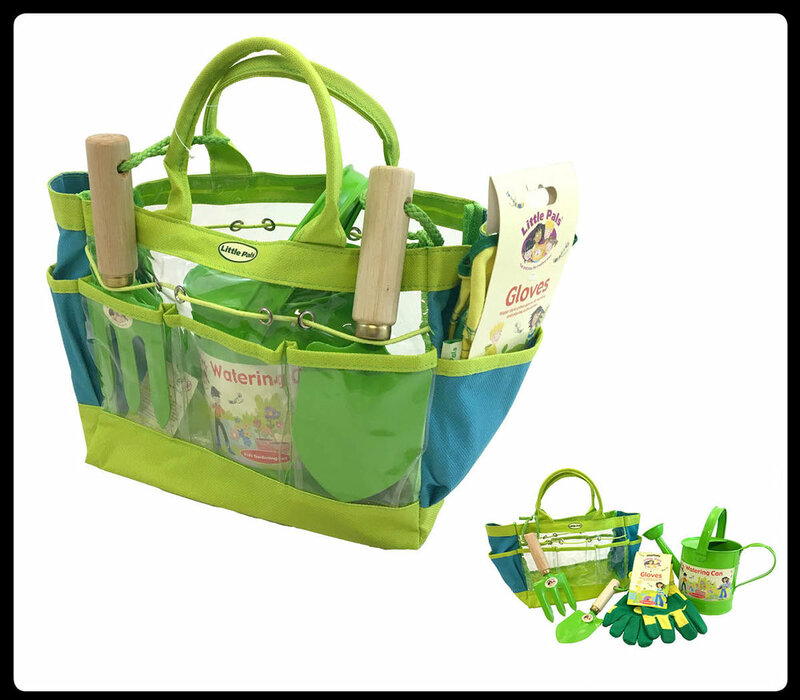 Includes carry/storage bag with handy pockets, hand trowel and hand fork, kids gloves, two plant markers, and a matching bucket. Tools have metal heads and sturdy wooden handles. Metal bucket has wooden handle. Two wooden plant markers add extra fun to this garden kit! Recommended Ages 3 to 10. Measures: 8.3"L x 7.1"W x 7.9"D; 1.0lbs. Adorable butterfly-themed and frog-themed growing kits are perfect for all of your little planting partners! Kit includes foam cushion, set of garden hand tools, kids gloves, and two mini growing pots. Tools have metal heads and sturdy wooden handles. Recommended Ages 3 to 10. Measures: 12.2"L x 12.2"W x 1.6"D; 0.8lbs. Let the gardening fun begin! Each kit contains a foam kneeler, matching hand trowel and hand fork, and a pair of children gloves for extra protection. Kneeler measures 13"L x 6"W. Tools have metal heads and sturdy wooden handles. Recommended Ages 3 to 10. Measures: 13"L x 5.9"W x 2"D; 0.6lbs. This product has been made to our high quality standards and certified to European Standards. All Little Pals products are environmentally friendly. The wood comes from managed forests and the paint is non-toxic and complies with European standards. Not suitable for children under 3 years of age. All Little Pals products should be used under the direct supervision of an adult. Inspect tools regularly for sharp edges and points. Dispose of worn or damaged tools. Keep tools out of reach of very young children. Copyright 2016. Tierra-Derco International, LLC.